Saves money, time and messy tear-out. Doesn't disturb walls or plumbing. 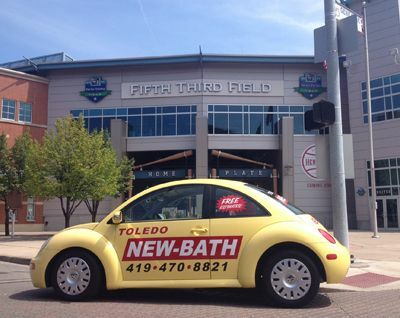 See Why Toledo New Bath? for additional product details. Highest mold, mildew and bacteria resistance. We can remodel your entire bathroom, not just the wet area. Flooring: linoleum, laminates, tile and DuraCeramic. Ceramic tile and shower doors. Who wants their bathroom and house torn up for days? Maybe weeks? The answer: of course no one! Most jobs can be completed in one day and you will have your bathroom back in full service.